be honor and glory throughout all ages. I got a wild hair on Sunday afternoon and decided to send all the people I work with Thanksgiving cards. I work in full time ministry, teaching at a private school, and we all consider this our mission field. It might not work out the same for you if you’re in an office or a more secular line of work. It all started because our high school principal is under the added strain of preparing for this accreditation year. I sent him a little note on Facebook to let him know he is appreciated. I decided to send another little note to our choir director, who puts in a lot of extra hours outside of the usual 8 -3 schedule. It didn’t seem right to thank a couple of people when so many do lots of extra little things that for the most part go unnoticed. So I had an epiphany – send a personal note of thanksgiving to everyone. I had planned to buy a pack of blank Thank You notes from Wal-Mart, but came back from town Sunday (it’s a 30 min. trip) and forgot. I did what any school teacher would have done in that situation. I used the letter die machine to stamp out 50 or so cards in the shape of turkeys. I hand wrote just 2 or 3 sentences on each card, and ended each one the same way: “I thanked God for you today.” Then I signed my name. It was a trivial amount of effort. Sometimes just knowing that anyone at all notices is enough to make a difference. I know what’s it’s like to work long hours, late at night, on the weekend, etc. and wonder if it even matters to anyone at all. Nicole Nordeman sings I Want to Leave a Legacy, and says “We all need an atta’ boy or atta’ girl.” Many people told me it made their day. Giving thanks is certainly biblical. Thanking God of course, but we are also told to edify or build up the body of Christ. Thanksgiving is just as Christian, if not more so, than our celebration of Christmas. This weekend is the first Sunday of Advent; Christmas is almost a lost cause, but I digress. The truth is, December is a busy month. Every group, organization, church, Sunday school class, etc, et al and so forth wants to have a party, a hymn sing, a tree lighting or some type of festivity. It can be a blessing and a curse. Live in a community surrounded by Christians and you can work yourself to death just trying to make an appearance at everything. I also have final exams and grades to get out before leaving for the holiday break. So… sometimes we get Christmas cards out and sometimes not. Everyone will get dozens of Christmas cards; do you actually open and read each and every one? Thanksgiving cards just seemed like the right thing to do. 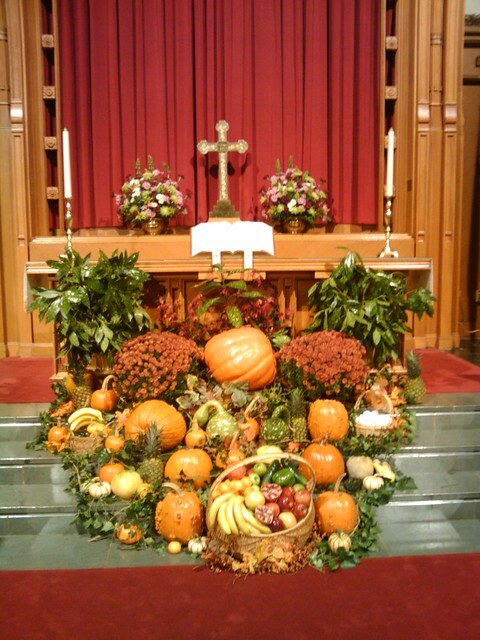 we give you thanks for the fruits of the earth in their season and for the labors of those who harvest them. Make us, we beseech thee, faithful stewards of thy great bounty, for the provision of our necessities and the relief of all who are in need, to the glory of thy Name; through Jesus Christ our Lord, who liveth and reigneth with thee and the Holy Spirit, one God, now and for ever. Source: Thanksgiving Day Collect, The Book of Common Prayer: And Administration of the Sacraments and Other Rites and Ceremonies of the Church: Together with the Psalter or Psalms of David: According to the Use of the Episcopal Church (New York: The Church Hymnal Corp., 1979), 194/246. I posted this last year, but I think it deserves a second reading. For those free gifts which you give so often. For your image, O God, within us. For our oneness in Christ. For the Spirit’s presence in our lives. For your steadfast love that makes us whole and holy.